Karma Ingram wanted to transform Los Santos into something totally new and alien. So, he spent hours abusing a glitch to merge in-game props and lights. The process made his PS4 sound like a jet engine, as if it was struggling to keep up with this interstellar travel. Luckily, the PS4 didn’t overheat even as he sculpted entirely new planets. Dutch, another GTA photographer, stood on the one of the runways of the Los Santos airport until the sun began to set. His friend flew overhead in a giant plane. That was Dutch’s cue to start kissing the air. The mandate was simple enough: just open a menu, and do an emote. The trick, however, was to align the kiss just as the plane dropped by. It took an hour and dozens of attempts. Players like Ingram and Dutch do all this system-melting work just to take the perfect snapshot. 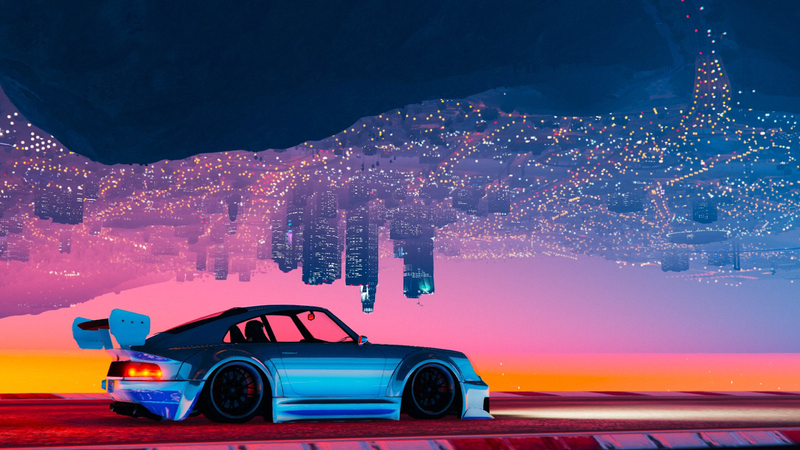 GTA V’s 2015 inclusion of a video and screenshot editor sparked a lively and large community of photographers who use the city of Los Santos as a virtual canvas. The “Rockstar Editor” allow players to record gameplay and then use the editor to manipulate camera angles, change filters, slow down time and even spawn in new NPCs and animals—but even with these tools, the process isn’t easy. In real life, photographers can go to different locations in the world, use props, or hire models. But in GTA V, you are limited by the map Rockstar has provided, the items they’ve created, and the animations they’ve included. Taking photos in GTA V, even simple ones, requires creative planning and thinking outside the box. But the results speak for themselves: some modern GTA V photographs look like they come from entirely different games. GTA photographer Alex Crowley, for example, wanted to take a photo of a dog lying on his chest, with the camera in-view. This actually isn’t possible in GTA V…unless you murder someone wearing a camera prop. So Alex spent an hour searching the streets of Los Santos looking for a paparazzi NPC. Once he finally found his target, he shot and killed him. Then things got weird. To get the dog to stand on the corpse’s chest, Alex Crowley had to use the Rockstar Editor to turn himself into a dog and then walk on top of the body, positioning his dog self near the camera. After all this, Crowley was able to snap this photo, which he described as one of his favorite and most popular pics. Still, limitations like these have lead to an impressive sub-community of players: Set builders. These players use the in-game track editor to create elaborate mini-locations which can be used to make spaces look totally different. Using the track editor, a feature in GTA Online that allows players to create new race tracks and stunt tracks, players can build sets that look like anything, so long as they have the time and patience to pull it off. Drew Barnes, a well-known set builder and photographer, used the in-game track editor to create his own wooden pirate boat from different props, boards and boxes. Alex Crowley explained that most of these builders create sets for themselves, but many are willing to share with anyone who asks. Set builders and photogs use the Rockstar Social Club website to share the custom built race tracks that contain these complex sets. Photographers will often credit set builders when sharing the photos online. To get a photo of a crashed UFO, Karma Ingram built an entire set around a small prop found in the GTA V desert. “I built a floor higher than the car with UFO on top at the hippy camp.” Karma Ingram explained. Building a set is only part of the work that can go into more elaborate photos. Some pictures may require other players, who all have to be coordinated, properly dressed and in the right spot. Photographers have to act as team leaders, keeping track of everyone and what they should be doing. Other photos may require hours of preparation, manipulation and experimenting. When the Duke O’ Death was added into GTA Online, Mach1Bud wanted to show it off. So, he started working on a badass set. It would be an epic scene that involved explosions and crashing blimp. Picturing this was easy enough, but staging it? That took nearly a week. The biggest problem, Mach1Bud told me, was that fire and smoke only renders up to a certain distance in-game, so he could never move too far away from the scene he was building without losing it. Like in real life, GTA V photographers each have their own style. Nik is a GTA photographer who prefers more real and natural looking photos. “In real life, I used to be part of a group that held yearly exhibitions and was a freelance photographer for a couple of years,” Nik explained. Searching through photographs taken in GTA V, you can find different themes, just like in real life photography. For example, black and white photos are popular and completely the change the look and feel of GTA V.
GTA V on PC, PS4 and Xbox One also includes a wide variety of wildlife, and just like in real life, animals in GTA V can hard to capture. These photographs are a fantastic look at a part of GTA V I rarely get to see, even as someone who plays the game all the time. You can also find more abstract and bizarre photos from the GTA V photography community. Some of these took a few minutes of me looking closely at them to see just how they were pulled off. Many involve repurposing props and items in ways not originally intended. Alex Crowley, taken at a Snapart and Visual Moods crew meet up. 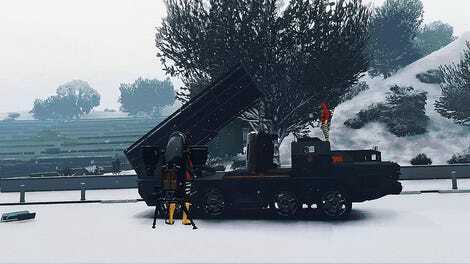 GTA Online and GTA V shutterbugs have formed groups where they share photos, tips, ideas, encouragement and criticism. Some of these groups are large, the GTAPhotographers group has nearly a 1,000 members. In these crews, players can share their best photos for inspiration and critique. These crews are also an easy way for set builders to share their new creations, allowing anyone in the crew to easily find the set and download it into their own game. While many of the photographers I spoke to are excited about the upcoming Red Dead Redemption II, the community isn’t waiting for it to release to take appropriate pictures. You can already find plenty of cowboy-themed snapshots floating around, all in honor of Rockstar’s upcoming game. For those looking to jump into GTA V and start taking their own photos, the folks I talked to offered some tips and advice. “Become an adventurer, have fun and learn to catch the moment with your eyes and snap it,” Alex Crowley said. “Keep doing it regularly, take inspiration and respect the people you admire in the community, hang out with fellow snappers and eventually you’ll develop your own style,” Nik said. “Above all, don’t be discouraged if your work doesn’t immediately get loads of attention on social media. If you keep at it, trying to get better and better, eventually you will earn an audience,” Mach1Bud said. Many also advised joining GTA V photography crews and following photogs on Twitter, where players will be exposed to new styles, ideas and techniques. The idea being that great inspiration can lead to incredible pictures.